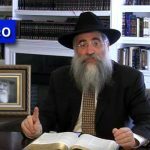 JEM has released a short clip of the Rebbe giving blessings for children, and the follow up on some previous blessings. A pair of twins born, and a purchase of a baby carriage in advance of the baby, the Rebbe manages to create a smile at every encounter. Video: How can we Receive the Greatest Blessings?